I was thinking , I will not try to bake bread at any point. As I knew bread making is not easy, it required skill and time. Yes time is the thing I lack most. I did make bread once when I have my oven back 4 years ago. 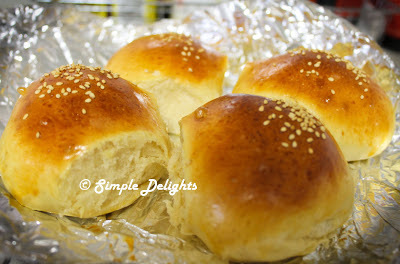 It was a recipe from a friend sharing with me how she make HK Sausage Bun. However the kneading and waiting sort of put me off. One should never say never. Here I am the first bun in 2013. I went to Sydney celebrate Chinese New Year. One of the place that must visit to me is the Japanese Big Bookstore - Kinokuniya. There is where I can find some chinese reading material including famous Taiwanese Teacher Meng Bun Making (孟老师的100道面包）. It really inspire me. She make baking seem so simple and easy. 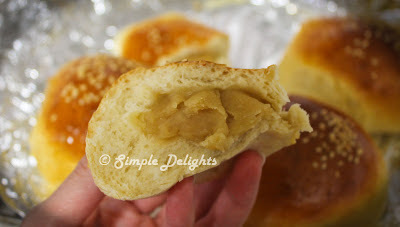 However I did try one of the recipe in the book and used another Christine recipe on this Chestnut Paste Bun. This recipe is using cook dough method ( Tang Zong). Which will help to make the bun softer. 1.Slowly mix the flour into the water well. Pour into a saucer pan cook in medium fire.Stir constantly as cooking. When you stiring and see line forming it mean the dough is cooked. 2. Scope the dough in a bowl, wrap it with cling wrap . Make sure the surface of the dough is cover with the wrap. Leave it cool in room temperature. If you not using it now it can be kept in fridge. I did mine one night before. 1.Put all the wet ingredient except butter into the machine follow by all the dry ingredient. Leave the instant dry yeast to the last. Make a well in the ingredient and place the yeast in it. 2.Used the dough function in operation. When all the ingredient start to mix and form a dough put in the butter. Let the machine continue it kneading process. 4.Take the dough out from the machine, press and knead the air out from the bread on a clean surface. Cut the dough into 10 portion. Roll it into individual ball cover with cling wrap and let it rest another 15min. 5.Weigh the chesnut paste 50g each . Roll into a ball as filling for the bread. 6.Use a rolling pin, roll out each dough into flat round shape and wrap the chestnut paste in it. Seal the top by pinching the dough together well. 7.Cover the each bread with cling wrap and rest for the 2nd time and raise double to the original size. It takes about 70min. 9. Put in the oven and bake for 15-20min. Once done take the bread out and let it cool on rack. This is the warm bread. And it was YUM !! I gave some to my friends as breakfast. However the bread is not as soft as I expected on the next day . Am not sure what was not right. Will I make bread again ? Is really a time consuming process. Is not about work need to be done. Is to wait for the bread to raise, wait for the 2nd raise. I can not go out to do other things which make me felt a bit annoy . Am learning to be effecient in all my baking which I think baking should be easy , simple and fast. However is indeed a good baking experience and to enjoy the fruit of your baking is always wonderful ^__^.